Is it just me, or are mocktails having a moment right now? I’m so glad Deb brought it up last week, because I’ve been noticing mocktail menus more and more at restaurants these days. I had a fantastic one at a fancy place a few weeks ago that I would re-order even if I didn’t have a human growing inside of me. The truth of the matter is, once I hit 30, all those gin + tonics in my 20s started catching up to me. Alcohol just isn’t cute for me anymore. You should know: I don’t consider wine to be alcohol–wine is actually sweet, sweet life blood sent from the Heavens. And yes, I have a little here and there. The little human likes it. Plus, her name is French, so I practically have a license to drink French wine while knocked up. I kid. Please don’t hate on me. We’re talking 1/4 of a glass of wine with a very full stomach of food maaaaybe once a week. Ok, fine, send hate mail. I’ll have my cork screw ready. So, the mocktail I had at the restaurant had at least two different types of herb infusions and bitters. Umm, I barely have time to put leggings on one leg at a time these days, let alone conduct kitchen experiments in tiny brown bottles. So, my answer to the herb infusion is this: bruise a cilantro sprig with the side of a knife. Insert into glass. After a few minutes, yes, you can really taste it! I felt like a genius for discovering this. I mean, no disrespect to the thousands of mixologists out there who make tinctures and bitters. I love all handmade things. I just don’t have time to make my own these days. One thing I will always have time for is flavored simple syrups, though. I make them in all sorts of flavors, but when I make a ginger one, I have to stop myself from drinking it straight. It’s just sooo good. You’re either a ginger fiend or a ginger foe, so if you fall on the other side, can I suggest orange peel with 1 peppercorn, or rosemary? I hear if we drink enough of these pretty mocktails, Spring will come sooner. Bottoms up! First, peel the ginger and slice it into very thin coins. Smash it with the end of a knife, and add it to a small sauce pan. Cover it with the sugar and 1/4 cup of the water. Bring to a boil, lower the heat and let simmer for 10 minutes, covered. It will be very fragrant. Let cool on the side. Next, bring the remaining 2 cups of water to a boil. Once boiling, turn off the heat, add the hibiscus petals, and cover. Allow to steep for 15 minutes. Be careful--this mixture will stain anything it touches. When done, strain and let cool. (You can do this ahead of time). Meanwhile, juice the pineapple in a juicer, or blend in a blender and strain. You could also use store-bought pineapple juice here. Strain the ginger out of the syrup mixture, and divide it between two tall glasses. 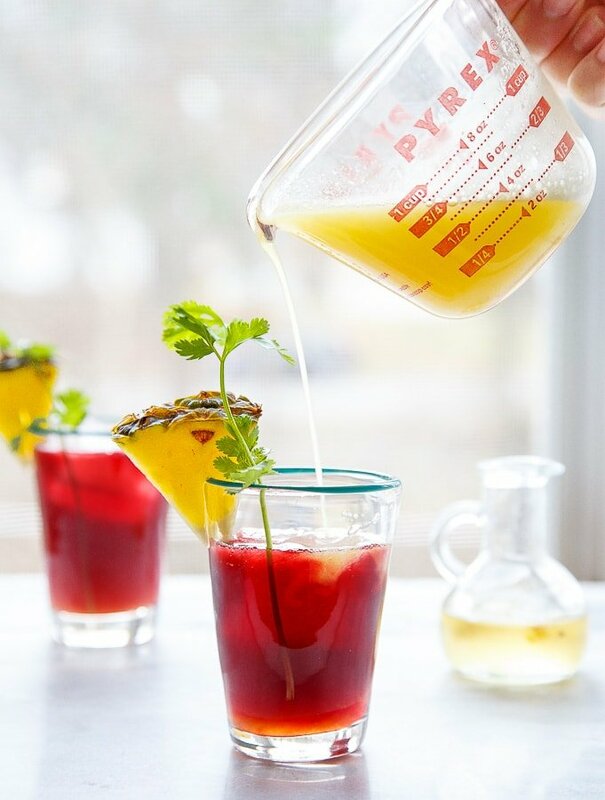 Add plenty of ice cubes, and top with equal parts of the pineapple juice and hibiscus tea. Finally, bruise the cilantro sprigs with the side of a knife, and add to the glass. Serve. You can absolutely scale this recipe up to serve a crowd. I frequently do! Just triple or quadruple all ingredients. The color of this is perfection! And even sans tiny human, I’m down for the mocktails. Alcohol isn’t that cute on me anymore either. I mean, 34 can be rough sometimes! Ha! Hugs to you! Mocktail or cocktail, I will take a glass of this any day! And a bit of wine makes the babe happy so bottoms up! Christina, it’s perfectly FINE for you to drink a little wine while pregnant . . you don’t even have to explain. . !! 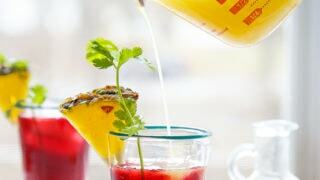 and let’s take a moment and celebrate this lovely pineapple hibiscus mocktail!!! I need me some dried hibiscus petals stat! This nurse agrees 100%. Also a tiny bit while breastfeeding is OK. This post cracked me up. I’m pretty sure wine is an antioxidant. That being said, it’s good for the wee one. This is one stunning mocktail–perfect for summer. Pinned. This mocktail makes me wish I was better at mixing drinks! Ohhh man, alcohol doesn’t look cute on my anymore either, past a couple beers I’m down for the count (aka bed at 10pm). Mocktails all around! This is so pretty and perfect for nights when I want a drink more exciting than water but less… um, well, damaging, than a bourbon on the rocks ;) Definitely making these stunners soon. P.S. My best friend is a doctor and encouraged his wife to drink (very) tiny glasses of wine with dinner occasionally throughout all 4 of her (very successful) pregnancies. Do you girl. Ha! 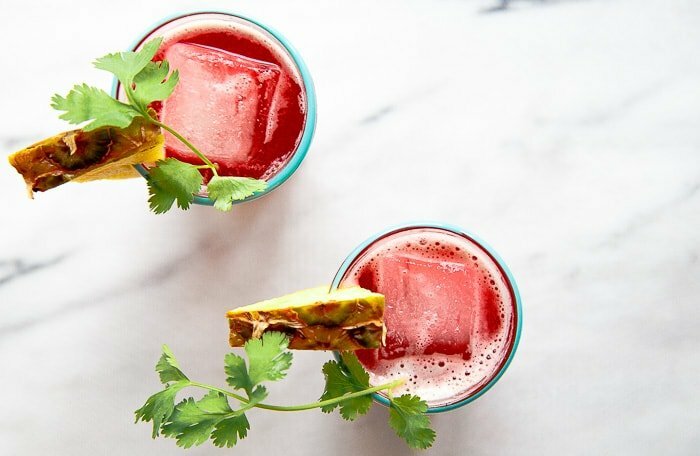 I do love your thoughts on wine.. :) These mocktails sound refreshing and are great summer patio party drinks..
Hell yeah mocktail, hell yeah occasional glass of wine! I read multiple studies (studying 400,000+ women.. I feel like that’s probably pretty, you know, accurate) that showed moms who drank lightly during pregnancy had smarter, better behaved kids and easier labors. So.. viva la vino is all I’m saying. I bought an expensive bottle and use my Vacu Vin to keep ‘er fresh and have a small glass once a week. And every other day of the week.. I am all about the mocktails! I crave pineapple pretty much constantly and have been missing my hibiscus which I obviously gave up for the first trimester. I musttttt make this! Girrrrrrl! These pictures – killing it!!! Did my photography idol just comment and say my pictures are killing it?! Excuse me while I go faint somewhere. You are my inspiration, Alanna!!! Ginger fiend here, can’t get enough! That mocktail sounds delicious and looks pretty to boot!! These look insanely good! I love the tropical flavors going on. And I think you are awesome for putting it out there about drinking while pregnant. Anyone who watches Mad Men knows that everyone used to drink while pregnant and I think moderation is really what matters. I love wine but hate hard alcohol and only drink wine or beer once or twice a month. However, I LOOOOOVE a nicely mixed mocktail and this is right up my alley! Hibiscus is one of my favorite flavors ever so I love that you mixed it with pineapple! I love this! I don’t drink (although I am 23 even though I look 16), so mocktails are the best. I’ll have to try this! Also I just found your blog and Instagram (found Instagram first), and I love it! Your photography is amazing, I can’t wait to try some recipes! Can we please bond over looking way younger than your age? Isn’t it the WORST? And people tell you all the time ‘you’ll be so grateful when you’re 40.’ Yeah, well, right now I’m 30 and I get carded and look like I’m 16 and pregnant! Mocktails are so super trendy now! I wrote an article about them last year when they were becoming popular, now they are everywhere. And I’m super excited about it! it gives us lightweights (and future moms) a chance to sip something composed, thoughtful and delicious without feeling lame. This one is amazing, what a fantastic flavor punch! Loved this post! Had me cracking up and I also love a helpful (cilantro) shortcut! Can’t wait to try it out. I am loving the mocktail moment! This drink looks amazing!